Despite the comic taking placed in what is basically a sun-bleached high-mountain desert, much of its art and story (as has been the case for much fiction I’ve written over the years) is influenced by my love for hardboiled detective fiction––often just called “noir” because of the visual impact detective movies made. More specifically (and I’ve already written about it), the influence of the world of Dashiell Hammett’s staccato prose and brutal treatment of his characters is something I’ve always admired even if I haven’t really ever tried (nor wanted) to emulate it. 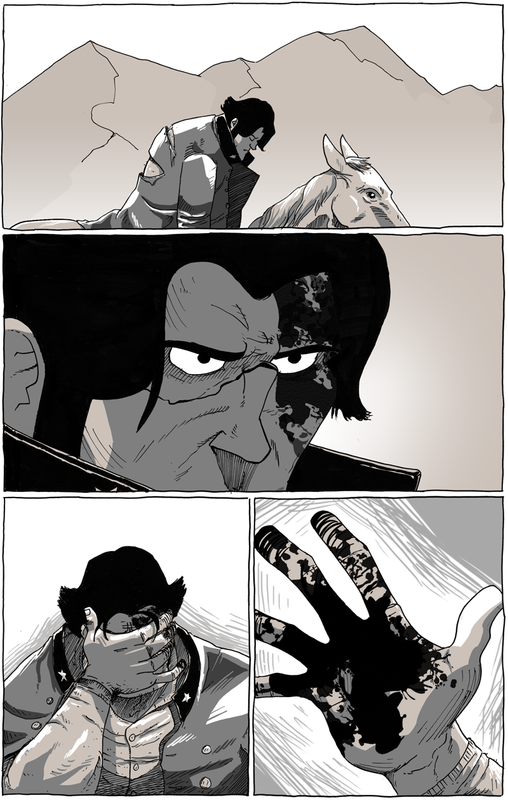 This comic may be the first of my works to be influenced by Hammett as Long John is going to go through the wringer. One of the classic tropes of detective fiction is first-person narration––well, the combination of narration and psychology as the detective parses out the mysteries of the mind and human nature as he or she goes along solving crimes. For a short while, Long John was going to emulate that, too. This page, for instance, was littered with captions as Long John was being quite profound. But now, the only remnant of that is the title for this page. What made me cut them out was the needs of the story––what does the story gain from being inside Long John’s head; more importantly, why does the reader need to be inside Long John’s head. Ultimately, I figured, the reader doesn’t need to be there, that angry stare in panel two is good enough. Another inspiration for this page is very direct: Becky Cloonan. 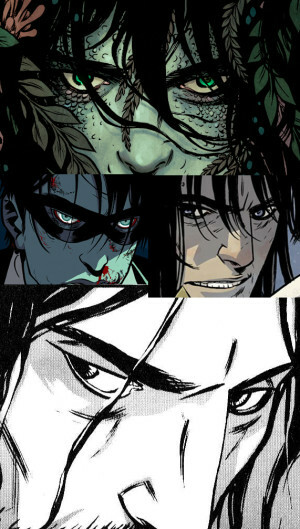 In the last year, I have become a champion for anything Becky Cloonan has done. She has recently found some mainstream traction as the artist for the acclaimed Image series, The True Lives of the Fabulous Killjoys, and was recently announced as a co-writer for the upcoming DC book, Gotham Academy (with art by webcomic hero, Karl Kerschl), and as the sole writer for an Image book, Southern Cross. I had found her work through various links to her stuff on the internet, but she did a single issue of the current run on Batman––the first female artist to draw the main Batman book, actually––and just fell in love with her art. I fell in love with her stories when I picked up her highly literary one-shot, self-published books, Wolves, The Mire, and Demeter. They are books that demand multiple read throughs because, even for Mr. English Major over here, they can seem a bit opaque at first glance. Luckily, the art is gorgeous. However, she has an artistic tic that I love, and I call it the “Cloonan Stare,” and it’s in pretty much everything she does. Though my style is different, I felt the second panel worthy enough to homage the Cloonan Stare.